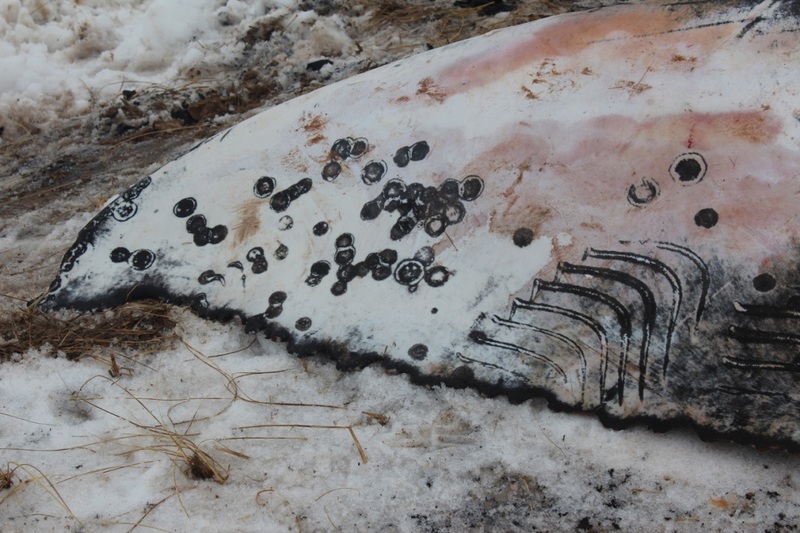 On March 25th, 2018, the stranding of a live juvenile humpback whale (Megaptera novaeangliae) on a beach of the Magdalen Islands was reported to the Réseau québécois d’urgences pour les mammifères marins (RQUMM). The evaluation of pictures taken by a volunteer revealed an advanced state of emaciation of the animal. Following consultations with experts it was determined that it would not be wise to attempt a rescue of the whale due to the very poor survival prognosis and to the high risks associated with such a complex procedure. The death of the animal a few hours after its stranding confirmed its advanced state of weakness. Two CWHC teams (Atlantic and Quebec) were dispatched to the Magdalen Island to conduct a full necropsy, thanks to the collaboration of RQUMM volunteers and the support of Environment Québec and the Department of Fisheries and Oceans Canada. Figure 1: Juvenile humpback whale stranded on a Magdalen Islands beach on March 25th, 2018. Photo credit: Sophie Beauchemin. Two sets of superficial curvilinear whitish scars were also visible on the tail. The pattern of these scars is indicative of rake marks caused by killer whale (Orcinus orca)7. Some killer whale ecotypes are known to attack large cetaceans,6 including the Artic bowhead whales (Balaena mysticetus), in which approximately 8% of whales harvested by subsistence hunters have signs of killer whale aggression.3 The frequency of killer whale rake marks on humpback whales varies by region and appears to be significantly higher in Canadian waters (between 15.9 and 18.9%)6 and in eastern Australian waters (17.0%)7 compared to humpback in Maine, West Greenland, Iceland and Norway waters6. Since these marks are superficial and completely healed, they probably had no impact on the health of this animal. No pathological condition that could explain the emaciation was identify on the macroscopic examination of the carcass. In addition, there were no signs of traumatic injuries that could have been caused by a collision with a boat or by an entanglement in fishing gear. The current hypothesis to explain this stranding is that this recently weaned juvenile humpback whale was not able to meet its nutritional needs and therefore suffers from chronic malnourishment. Its stranding appears to be secondary to a state of generalized weakness associated with a negative energy balance. However, histological examination of tissues taken during the necropsy will need to be done if we want to rule out infectious diseases. Figure 2: Barnacle marks (on the left) and killer whale rake marks (on the right) on the tail of the stranded humpback whale. Ackman, R. G., Hingley, J. H., Eaton, C. A., Sipos, J. C., Mitchell, E. D. (1975). Blubber fat deposition in mysticeti whales.Canadian Journal of Zoology, 53(9), 1332-1339. Giroux, M-S for Baleines en direct. (2018). Il neige sur les baleines! Retrieved from: https://baleinesendirect.org/il-neige-sur-les-baleines%E2%80%89/. Lesage V., Gosselin J-F, Hammill M., Kingsley M.C.S., Lawson J. (2007). Ecologically and biologically significant areas (EBSAs) in the Estuary and Gulf of St. Lawrence – A marine mammal perspective (Document de recherche 2007/046). Ottawa, Canada: Canadian Science Advisory Secretariat, Fisheries and Oceans Science. National oceanic and atmospheric administration (NOAA) Fisheries. (2018). 2016-2018 Humpback whale unusual mortality event along the Atlantic coast. Retrieved from:http://www.nmfs.noaa.gov/pr/health/mmume/2017humpbackatlanticume.html.